I couldn't resist making a stop at Lord of the Fries. I do love French Fries, after all, and I wanted to see what this eatery was all about. 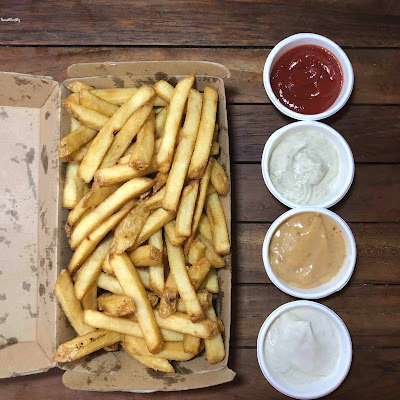 Of course, this Australian-born chain specializes in French Fries (Classic, Chunky, Shoestring, and Sweet Potato), and offers a variety of different types of sauces to go along with the fries. Classic Sauces are served on the side. Deluxe sauces are served on top. I decided to order three different Classic sauces (ketchup is free) - Kiwi (Creamy Tartare Sauce), Parisian (Aioli Garlic Mayo), and Vietnamese (Spicy Chilli Mayo). All of the sauces were quite tasty, but I enjoyed the Vietnamese the most, because I love spicy! The fries by themselves were great too! In addition to fries, Lord of the Fries offers vegan and vegetarian burgers and hot dogs. I definitely want to try more sauces should I make it back to a Lord of the Fries again! Labels: auckland, dining, family travel, Hawaii mom travels, new zealand, travel, visit auckland, visit new zealand.